Swivel Section: Cold forged top plate, yoke and button are all heat treated to prevent brinelling, improve swivel action and increase service life. Load and thrust bearings are hardened and ground and rotate on hardened raceways. Top plate and legs are 1/4" steel, legs formed for increased strength and continuously welded to yoke. All swivel sections are equipped with a lubrication fitting for field maintenance. RWM lubricates all swivel sections prior to shipment. Wheels: Wheels are available with either straight roller bearings which rotate on a hardened and ground spanner, RWM's annular ball bearing for ease of reliability, or delrin/plain bearings for wet applications. All wheels are 2" wide. Raceway Design: Patented Kingpinless™ single ball bearing precision machined raceway hardened to 50 Rockwell C. Swivel section features a 2-3/8" diameter raceway with 3/8" ball bearings. Top Plate Size: 4" x 4-1/2" x 1/4"
Bolt Hole Spacing: 2-5/8" x 3-5/8" Slotted to 3" x 3"
Raceway Design: Patented Kingpinless™ single ball bearing precision machined raceway hardened to 50 Rockwell C. Swivel section features a 3" diameter raceway with 1/2" ball bearings. Top Plate Size: 4-1/2" x 6-1/2" x 5/16"
Bolt Hole Spacing: 2-7/16" x 4-15/16" Slotted to 3-3/8" x 5-1/4"
Wheels: Wheels are available with either 1" roller bearings which rotate on a hardened and ground spanner bushing or a 3/4" tapered bearing that rotates on the axle. All wheels are equipped with a lubrication fitting. Raceway Design: Patented Kingpinless™ single ball bearing precision machined raceway hardened to 50 Rockwell C. 4-1/4" diameter raceway with 5/8" ball bearings. Top Plate Size: 6" x 7"
Bolt Hole Spacing: 4-5/8" x 5-1/2" Slotted to 4-3/8" x 5-5/8"
Wheels: Wheels are available with either 1-1/4" I.D. roller bearings which rotate on a hardened and ground spanner bushing or a 1" tapered bearing which rotates on the axle. All wheels are equipped with lubrication fittings. Leg Thickness: 1/2" legs are welded inside and outside for strength. Top Plate Size: 8-1/2" x 8-1/2" x 1/2"
Bolt Hole Spacing: 7" x 7"
Wheels: Wheels are either 3",4",5" or 6" wide depending upon wheel size and type. Wheels have either 1-1/4" or 1-1/2" roller bearing or 1-1/4" tapered wheel bearings. Roller bearing wheels rotate on hardened and ground spanner, tapered wheel bearings rotate on axle. All wheels are equipped with lubrication fittings. Raceway Design: Patented Kingpinless™ single ball bearing precision machined raceway hardened to 50 Rockwell C. 7" diameter raceway with 3/4" diameter ball bearings. Wheels: Wheels are either 3-1/2,4, 5 or 6" wide depending upon diameter and wheel type. Roller bearing wheels are equipped with a 1-1/2" bearing which rotates on 1-1/2" O.D. spanners. Tapered bearing wheels have a 1-1/4" I.D. tapered bearing which rotate directly on a 1-1/4" axle. All wheels have lubrication fittings. 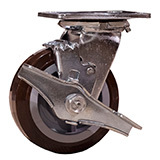 Wheels: Wheels are available with either straight roller bearings which rotate on a hardened and ground spanner or RWM's annular ball bearing for ease of rollability. Spacers: Oversized spacers provide protection from string build-up and reduce cleaning time by 80%. Swivel Section: Cold forged top plate, yoke and button are all heat treated to prevent brinelling, improve swivel action and increase service life. Load and thrust bearings are hardened and ground and rotate on hardened raceways. Top plate is 1/4" steel, legs forged for increased strength and continuously welded to yoke. All swivel sections are equipped with a lubrication fitting for field maintenance. RWM lubricates all swivel sections prior to shipment.